Disclaimer: I was provided with products to review in order to give my honest opinions. This giveaway is part of a giveaway hop we think you will enjoy! Happy holidays! 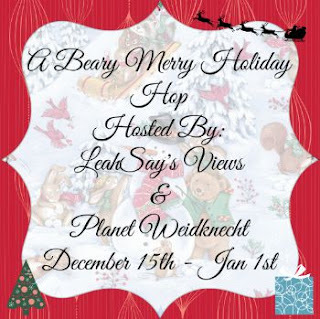 Here is an end of year giveaway hop that you are going to go NUTS for, with LeahSay’s Views and Planet Weidknecht bringing you a barrage of blogs with giveaways to get you through the season! Here at Mom's Gone Bronson, we have for you, a GREAT prize from Oh! 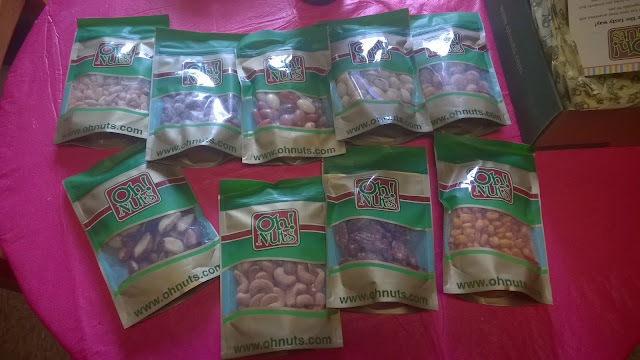 Nuts, who sent us 2 gift boxes of nuts to review and to tell you guys that you'd have to be nuts...CRAZY... to miss it! I had the chance to try out 2 different gift boxes and one came with 9 packets of different kinds of nuts from salted peanuts to honey coated pecans, which I have to say are my absolute favorite of the entire lot, which apparently were everyone elses favorite, too! These pecans are delicious and they were the go-to for everyone, until they were all gone and another nut had to take center stage! 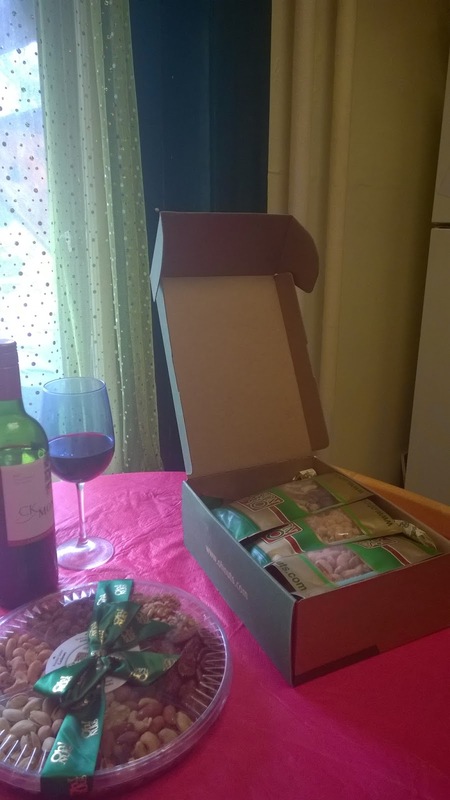 I was delighted to try out the Holiday Mixed Nuts Gift Box/ Nuts Gift Basket AND the 6-Section Assorted Nut Platter, which is actually great to top up with MORE nuts when you run out of the first batch! Suffice to say, we are in nut heaven right now in our home and they make for a great center piece on the main table or a coffee-table dabble for visiting guests! You can visit Oh! Nuts and see what goodies they have for you this holiday, which evidently consists of more than just nuts alone! You can pick up nuts, dried fruit and even candy gift baskets that fit with the current season and all of which make for perfect Christmas gifts and stocking stuffers! The lovely people over at Oh! Nuts want to give away, to one of you lucky readers, a nut selection gift box valued at over $30! All you have to do, to be in with a chance of winning, is live in the U.S.A, be over 18 and enter via the rafflecopter, below! That's it! Please enter using a valid email address so we can contact you win. All winners are alerted within 24 hours of giveaway end and must claim their prize within a 48 hour window. If the prize is not claimed then the prize becomes forfeit and a new winner is chosen in the same manner until we have a confirmed winner - this is why it is so important for you to use a valid email address. We never chase you around social media and never sell or give away your information! Mom's Gone Bronson is not responsible for prize fulfilment. The prize is shipped directly from the company providing this prize. Thank you! All that being said, GOOD LUCK!! For more giveaways, get in on the hop, below for some awesome goodies! I love the Oval Dark Chocolate & Nut Gift Basket. As far as recipes go, I think nuts make everything better! I use them in baking and in salads. I like their Holiday Santa Booties With Goodies - Snowflake. I love pistachios myself. The 4-section sugar free gift set is perfect for many of my relatives and neighbors. My favorite is the Holiday 4-Tier Gold Gift Tower. The Gourmet Signature Wicker Basket sounds Great. I like the Hand Made Gourmet Truffles Gift Box - 12 Piece Box. 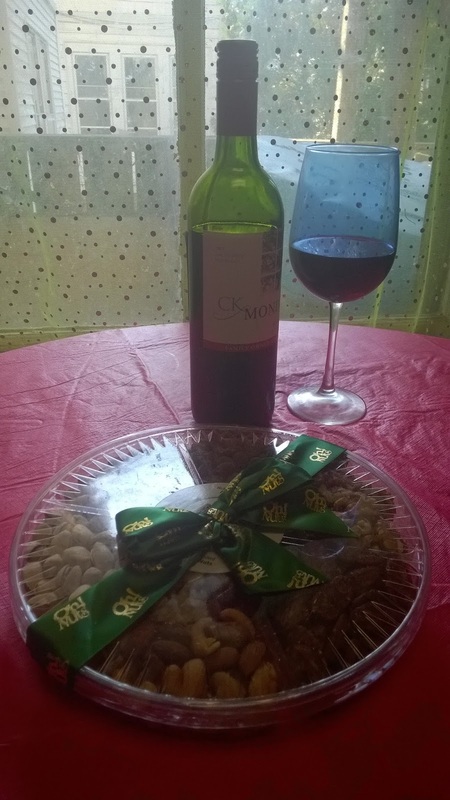 I like the Holiday Mixed Nuts Gift Box/ Nuts Gift Basket! I like the 4-Section Wooden Nut Gift Tray. Any of the nuts and chocolate gift sets!! Im a chocoholic!! I want the Holiday 4-Tier Gold Gift Tower, can't go wrong with that one, so much variety! This is super cute https://www.ohnuts.com/buy.cfm/new-baby/gifts/girl-6-section-gift-tray! Realistically, any of the gift trays are awesome! I love nuts of all kinds! I would love to try their Handmade Gourtmet Truffle Gift Box! I like all of them but anything with pecans, I'm in. Especially pecan pie. I like the 8-Inch Holiday Gold Beaded Gift Tray. I love the Carousel Snack Nuts and Candy Wheel. It is so much fun. I could see people spinning it around to find their favorites. I would love the Mega Nuts Gift Tray! I like the 6-Section Assorted Nut Platter - Nuts Gift Basket. I love the Carousel Snack Candy Wheel. My favorite is the Non-Dairy Chocolate Truffle Gift Box - 18 Pc. Thanks. The Gourmet Signature Wicker Basket looks so amazing. I love the 6-Section Assorted Nuts Gift Basket. They have all the kinds of nuts I love. One of our favorite recipes with nuts is actually a loaf main dish made with mushrooms and walnuts. It is delicious! We like the Mistletoe Holiday Gift Tower and the Holiday 4-Tier Gold Gift Tower. One of our favorite nut recipes is banana nut bread. Thank you for the opportunity to win. I like the Christmas Stocking Stuffer Snack Jovial Dot Gift Box. Thanks! My favorite is the Hand Made Gourmet Truffles Gift Box - 12 Piece Box! The Handmade Truffle Set looks delicious! I would love to try the handcrafted praline chocolate log! That sounds so yummy. I would love to try the nut & seed brittle crunch! I LOVE their Roasted Salted Cashews - 10 lbs.It must be popular, it saays they are sold out right now! I can eat cashews until I am stuffed they are so good. I love nuts in my sweet potato casserole and my Mexican wedding cookies. Roasted Salted cashews are my favorite for snacking. I just love the four section wooden tray nut selection. The 6-Section Assorted Nut Platter - Nuts Gift Basket looks like a nice gift! Everything looks awesome, but I would be most excited to try the Carousel Snack Wheeler Nuts Gift Basket! That would definitely be the centerpiece at my holiday table! I like the 6-Section Assorted Nut Platter. They all look good, I'm a nut "nut". I like the Gourmet Signature Kosher Wicker Gift Basket. I love Oval Dark Chocolate & Nut Gift Basket. It looks yummy! I like the Carousel Nut Wheeler. ...the "Oval Dark Chocolate & Nut Gift Basket." The Viennese Cashew Crunch looks delicious. I'd like their Trail Deluxe Mix! Look absolutely scrumptious. I would love anything with cashews or pecans in it. Or I love to eat them plain. I like the 6-Section Sugar-Free Gift. I like the Oval 7-Section Nuts & Chocolate Wooden Tray! My favorite is the 72 Pieces Gourmet Dark Chocolate Covered Crunchy Pretzels Gift Box.